Did you catch Day 1, 2, 3, 4 and 5 - if not, why not? Alex Beadon's Feel Good Blogging Challenge has been a lot of fun! So, Day 6 - Vulnerability. Any regular readers will know that over the past year or so, I really haven't hidden from the fact I suffer with anxiety and have suffered with depression in the past. Anxiety and depression are things many, many people suffer with - probably way more than we all realise but now the media and mental health charities are stepping up and doing a bit more to help. And I am SO bloody pleased to see that. I suppose as well as suffering with anxiety and depression, that's led me into feeling social anxiety. It takes me a big pep talk to get me to go out of the house sometime - especially if it's for something involving alcohol. Whilst at uni, I had a bit of a problem with drinking - nobody that knows me will really believe this to a certain extent because I was always up for a night out, always suffering with a hangover, laughing about not remembering bits of the night before...that's student life. Yeah, there's the learning but people go to uni (a lot of the time) for the social life that comes with it). So basically, I can't drink...I don't like it. It not only makes me suffer with a hangover (obvious) but it also triggers my depression/anxiety and not only that, I have been suffering with severe cystitis for around 5-6 years now. Alcohol and me are just a big no no - yet I still do it...I did it this weekend and boy, did I suffer. Yesterday, I had probably one of the worst hangovers I've had since day 2 of my travelling in Bangkok over 12 months ago. I had really, really severe cystitis (and still do today) and well, my moods...they're turbulent. A task at work that should have taken me 10 minutes took me much longer because I got myself ridiculously worked up. But, that's by the by. I suppose this post is really to address that fact - we are all vulnerable; some people talk about it and some don't. I talk about it because well, I'm not embarrassed about it and if I can help or make one person feel better or feel like they're not alone, then I will. I'm not embarrassed to admit I still suffer with anxiety on a very regular basis, I still have bouts of depression - they aren't things that are cured or solved overnight. And my chronic reoccurring cystitis - well it bloody consumes my life most of the time. EVERYBODY is vulnerable. In one way or another, we all feel vulnerable - whether it's mentally, physically...something big or something small. 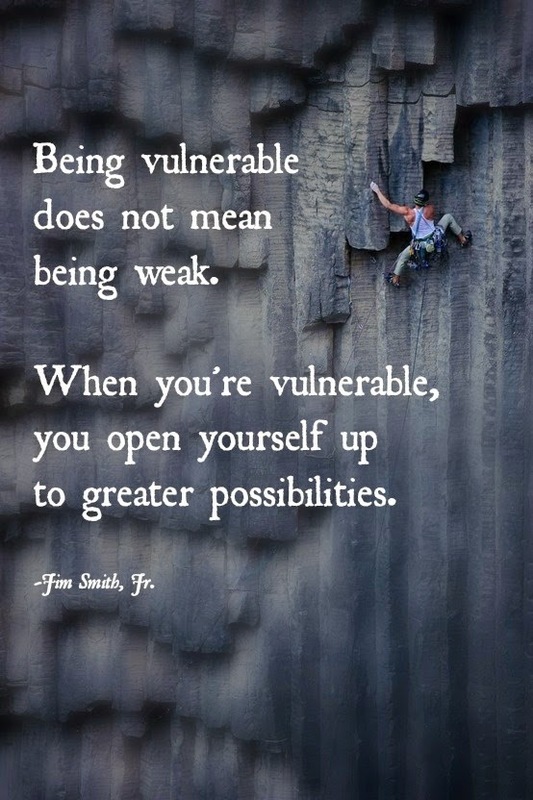 And like the quote above says - being vulnerable isn't such a bad thing and it can lead to great things. We all feel vulnerable but it does one of two things - makes us strive to do better or it can make us crumble. And that's the thing, we need it to do the first. Tackle your vulnerability head on and just keep taking each day as it comes - that's what I have to do now. I'm a planner and I like to have things pencilled into my diary but, sometimes, anxiety/depression/vulnerability can come out of nowhere...literally out of the blue - it can throw your plans out of the window. When this happens, I write the day off and try and just carry on, thinking of the tomorrow as a brand new day to show the world what I can do. An anxious few days has left me feeling like I'm ready to fight again. I am probably in the best position I've been in for a long time - so my vulnerability is going to play a part in leading to great opportunities for me. I just know it.